I made this valentine using this week's freebie at Delightful Inspiration. I colored the image using crayola colored pencils. I added white flocking for wool and Christmas red stickles to the heart. The sketch I used is from the challenge at Create 4 Fun. I flipped the sketch, added a wider ribbon and used 2 large flowers instead of the 3 small ones. 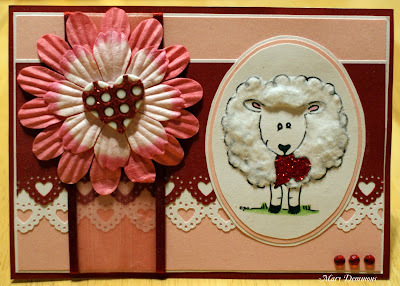 Adorable card..love the Ewe..lol Thanks for sharing this little cutie with us at OSAAT. What a nice card you've made with my sketch. The image is very lovely!